HAS MALAYSIA FLIGHT 370 BEEN LOCATED? After all this time, is it possible that the wreckage of Malaysia Airlines flight 370 has finally been found? Debris has been discovered on the French island of Reunion in the western Indian Ocean off the coast of Madagascar. If the debris found is that from Malaysia Flight 370, it will have been located some 3800 miles from where the plane was last spotted. The debris from the aircraft found was about six feet long and covered in barnacles. Malaysia Airlines flight 370 disappeared in March of 2014 while flying from Kuala Lumpur to Beijing. Debris found on Reunion Island believed to be a ‘flaperon’. Nearly 18 months since Malaysia Airlines flight MH370 vanished, a 2.7m-long piece of debris discovered on Wednesday on the island of Réunion could finally provide clues to one of aviation’s great mysteries. Investigators suspect the debris is a “flaperon”, a mix of a flap and an aileron. To provide some context, see where the ill-fated Malaysian flight took off from and the subsequent search areas after the plane went missing. 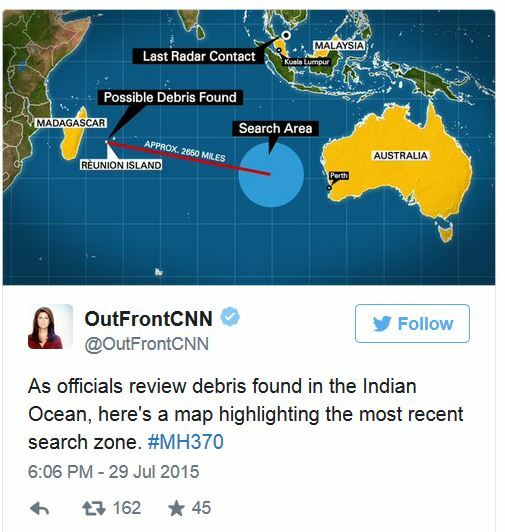 Developing news in the Indian Ocean this Wednesday, where debris from an aircraft has been discovered. A US official says investigators are extremely confident that it belongs to a plane that went missing more than a year ago. The official says investigators identified the parts as being from the edge of a Boeing-777 Wing. The same model as Malaysia Airlines flight 370 that disappeared in March of 2014 while flying from Kuala Lumpur to Beijing. 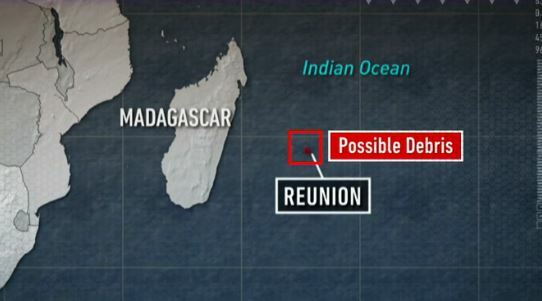 Investigators are now heading to the French island of Reunion in the western Indian Ocean for further inspection. 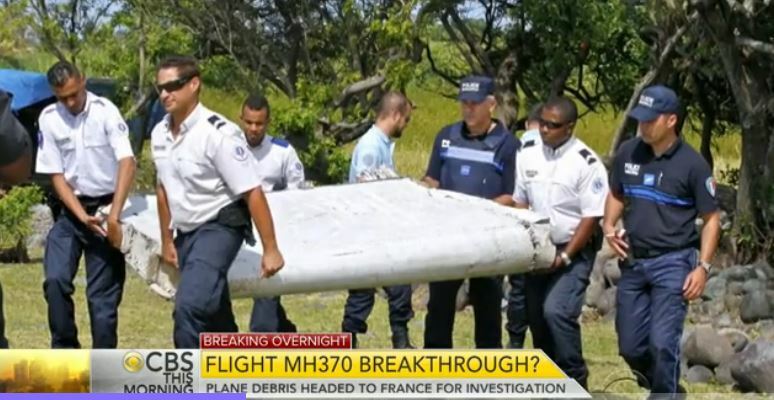 UPDATE I: Australia increasingly confident debris found is from MH370. Authorities hunting for Malaysia Airlines flight MH370 said Friday that they were “increasingly confident” the wreckage found on an Indian Ocean island was from the ill-fated jet, raising hopes of solving one of aviation’s great mysteries. The two-metre long piece of wreckage is to be sent to France for analysis, with hopes high that it could turn out to be the first tangible proof the plane went down in the Indian Ocean. Investigators are hoping they will then move closer to understanding the mystery swirling around the Malaysia Airlines Boeing 777, which vanished 16 months ago with 239 people aboard, most of them Chinese. “We are increasingly confident that this debris is from MH370,” Martin Dolan, chief commissioner of the Australian Transport Safety Bureau, which is leading the MH370 search, told AFP. Reuters reports that following the ground to air missile attack that blew Malaysia flight MH17 from the sky, bodies of innocent men, women and children rained down on the Ukraine village to the horror of the villagers below. Bodies of the victims of Flight MH17 fell on to people’s yards, on their homes and broke through their roofs. The terrible reality was that the sky was raining dead bodies, body parts and pieces of the missile targeted plane. This is what Barack Obama described the situation as, ‘Looks like it may be a tragedy’ just before he went off to two fundraiser in NYC following this terror attack and act of war against a civilian airplane. How does Obama justify fundraising and jokes to the images below in the truly disturbing video? Even yesterday, bodies and debris scattered the countryside as the smell of death and jet fuel was in the air. First came the loud explosion that made buildings rattle: then it started raining bodies. Good grief, what is wrong with this president, has he no shame? After 23 Americans are believed to have been killed when Malaysia Flight MH17 from Amsterdam to Kuala Lumpur was shot down by a surface to air missile by Russian separatists over Ukraine airspace, Barack Obama attended two fundraisers in New York City. ARE YOU KIDDING ME!!! How detached could one individual possibly be when Americans civilians are killed by an act of war/terrorism and a sitting president just goes about his merry way and attends a fundraiser? Sorry, but there is something seriously wrong with Obama that anyone would think that it was okay to do so. All Americans should be sickened by his actions. TAKE A GOOD LOOK AT THE PICS OF THE DEATH AND CARNAGE AND COMPARE THAT TO OBAMA GOING OFF TO FUNDRAISERS AS IF NOTHING HAPPENED. SICK, JUST SICK!!! Republicans are assailing President Obama’s decision to attend two fundraisers in New York City Thursday night after 295 people perished when a Malaysian passenger jet crashed in Ukraine after an apparent rocket attack and Israel launched a ground war in Gaza the same day. Republican National Committee Chairman Reince Priebus took to Twitter to launch a broadside against Obama for going through with the fundraisers benefiting House and Senate Democrats. “With all that is going on, the last thing the President should be doing is fundraising right now. Now is a time for leadership,” Priebus tweeted. Sen. John McCain, R-Ariz., was far harsher in his assessment. Twenty-three Americans are believed to have died in the crash, although U.S. authorities have yet to confirm those numbers. 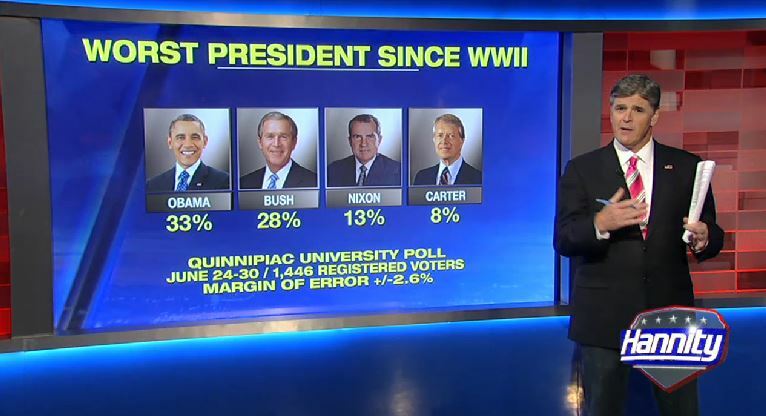 Barack Obama is no leader. If he had any respect for the United States of America, he would just step down from office for the sake of America. But that will never happen, because Obama is a “community agitator” and his every action is meant to divide and destroy the America that we knew. Sorry, but Obama would have gone fund raising on 9-12-2001. An intercepted conversation released by the Security Service of Ukraine (SSU) reportedly between Russian-backed militants nicknamed “Major” and “Greek” show admission of Russian militants purposely shot down Malaysia Airlines Flight MH17 near the village of Chornukhine, Luhansk Oblast. However, Russian President Vladimir Putin said the blame for the tragedy lies with Ukraine. The Malaysia Airlines passenger plane carrying nearly 300 people was shot down near the Ukrainian border. An adviser to Ukraine’s Interior Minister has said 23 U.S. citizens were among the 298 killed. “Major”: The plane fell apart in the air. In the area of Petropavlovskaya mine. The first “200” (code word for dead person). We have found the first “200”. A Civilian.